First a Japanese tour that was life changing and now a tour of Spain in September....So blessed! Our very first show is at the Xiria Pop Festival in Carballo, shows in Madrid, Barcelona, Cáceres, Cantabria, Granada! Plus soon we'll be sharing the music videos and recordings for the Juliana Hatfield songs we recorded for our upcoming 7" tribute album on American Laundromat Records! They're wicked- you're gonna love em too! Wendy Norton created the "Universal Heart-Beat" music video for us and our other friend James William Glass created the "I See You" music video. Skokie Backlot Bash was a ton of fun! Thanks to everyone involved and the people that enjoyed the festivities with us. Now we're "fools for Skokie village"
The Safes 7" record on Bickerton Records and Action Weekend Records will be released Sept 14 in conjunction with our tour of Spain! More details to come!! James William Glass has created another gem of a video for The Safes rendition of "I See You" and Wendy Norton is working on a stop-motion diddy for "Universal Heart-Beat"
Mixing the Juliana Hatfield tribute songs at Electrical Audio very soon! We'll keep you posted. Ted Ansani and Mike Zelenko of Material Issue inside Electrical Audio with Steve Albini all on 2" tape for our upcoming @americanlaundromatrecords 7" double single tribute to incredible @julianahatfield !!! To make it even more special, our great friend and remarkable artist Nicole Anguish of Daykamp Creative is designing the artwork so you know it's going to look stellar. has been a major thrill and honor for us. Thank you to everyone involved; we still can't even believe this is real and look forward to sharing more details over the next couple of months before the release. Wanna hear some additional exciting news? The Safes are thrilled to announce that we will be releasing a 7" record in Spain on Action Weekend Records and Bickerton Records this fall! Thanks to Carlos and Juanma for joining forces to make this happen. More news on this soon! Japan you make dreams come true, thank you! What can top that? Arigato: Toyozo, Chris Jack, PopNRoll Atsushi, Club Heavy Sick, The Fadeaways,The Knocks, Car Crash, DJ Fumie, DJ Bisco, MELLVINS!, Everyone at Dream on Records, Mule Team, DJ SxT, DJ Toyozo, Shotaro Ta2rou, Emilingo at Green Apple, Gorilla*, Create Actions, Bobsleigh Trio, DJ Kame, Illustrator Kame, DJ Chokkan, FiFi, Lesley and Jackie, Hokage, The Bryan, Koichiro of Not Rebound, Onepercenters, Ax Little City & Construction Nine, Ryota Suda of Nerd Magnet, Toru, Yoko, the fine folks at Bar Bassic, The Routes, The Lovebites, Kurachi at Big Beat Records, Scott at Hidden Volume Records, Rob Perry, Laurier and all our new friends in Tokyo, Yokohama, Osaka, Fukuoka!!! Hot off the presses! How about this? Have you read The Safes feature interview in Japan's largest English magazine, the Tokyo Weekender? Please check it out here! Thanks to Laurier Tiernan for the interview! Thanks to Aaron over at 50THIRDAND3RD! 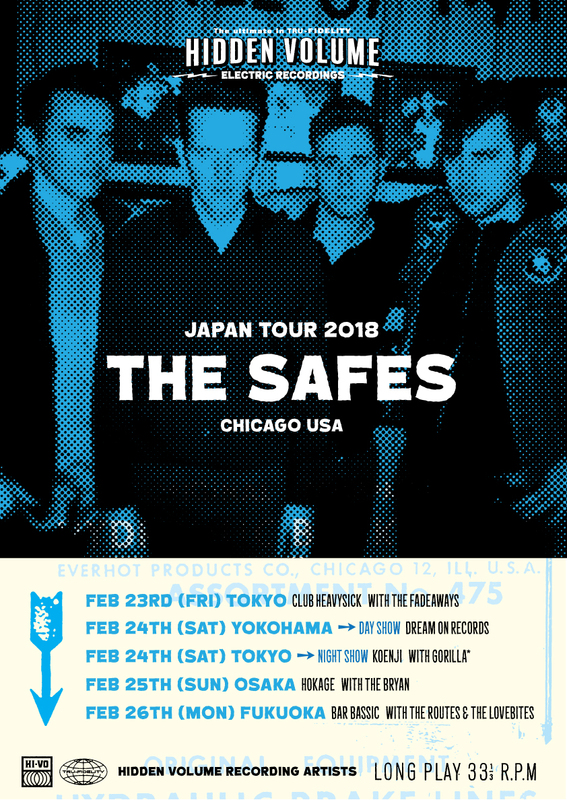 Check out this cool interview Frankie did with him about The Safes, working with Hidden Volume Records, our upcoming tour of Japan, the Chicago scene, Vinyl and much much more, like influences! You can read the interview here! Here is some Chicago love too! Please read this awesome interview Rachel Zyzda of ANCHR Magazine did with Frankie about The Safes, making Tasty Waves and our upcoming Tour in Japan! Check it out here! Boy Madison, WI you sure know how to have some fun and throw a stellar bday bash for the incomprable Heather Hussy! Thanks to our friends in The Hussy, Last Sons of Krypton, and Psychic Drag and everyone that came out to celebrate Heather! ALRIGHT TOKYO! ARE YOOUUU READY???!!! WILL YOU WELCOME HIDDEN VOLUME RECORDING ARTIST THE SAFES! The Safes couldn't be more thrilled about what we'll be doing at the end of February 2018: a four city, 5-show Hidden Volume Records tour of Japan! Stoked to be sharing the stage with our superstar label mates The Fadeaways @fadeaways_toyozo + Gorilla @popnroll and @theroutes!! Also very stoked to be playing in Osaka with The Bryan and @dor_rec in Yokohama too! We are gonna try and break into Budakon set up and play there too, ha! Maybe we'll get arrested and become famous in Japan for that! Show dates and venues are on this awesome tour poster designed by Scott at @hivorecords and Chris from the Routes! Thanks dudes! And thank you to everyone at Hidden Volume and all these great bands for making this all possible! People always say "Living the dream" we actually mean it! Plus, we actually have some additional very exciting and big news to share soon! Please stand by for that, The Safes are really stoked about that as well! Watch the Streets and Sanitation video directed by James William Glass (PLRLS) !!! Midwest and West coast we're coming for you - MO, OK, NM, AZ, CA, NV, UT, CO, KS, NE, IA, IL...and playing with tons of great bands! Don't forget to relisten to The Safes on Joe Belock's WFMU's 3 Chord Monte show and his show every Monday noon to 3pm - rocknroll people!!! Did you see Tim Hinely's Tasty Waves review at Daggerzine? "Chicago's The Safes play sugary-sweet garage pop tunes that are a sure cure for any sour mood. Their new album, Tasty Waves, is 22 minutes of warm, summery-pop bliss"
The Safes follow a familiar trajectory in band development, from raucus rock and roll origins to a more refined sound as we get closer to the present. Deception from 2006s Well Well Well showcases the fun, almost live feel of their early work. But fast forward to the 2013-16 period and the sound has shifted to more melody and harmony on tracks like Live Life Like You Want to Live with its almost plaintive single note piano solo. The basic elements are actually all still there, theyve just been rejigged in importance, as can be seen from the great rock and roll guitar intro to I Would Love You, which also features a distinctive keyboard solo, this time on organ. Which brings us to the present and The Safes fabulous new record Tasty Waves. Sounding like a more punky version of Apples in Stereo, the band aces the first single and opening track Hometown with its chiming guitar and swinging hookiness. Here comes a serious ear worm infection! The whole album is pretty strong, though Id single out Streets and Sanitation for special mention with its insistent strummy-ness, rumbly lead line and nice horn motifs. Be on the lookout for us performing live on two killer radio station WXPN in Philly and WFMU in NJ/NYC!!! Thanks to Richard Milne for spinning us on WXRT Local Anesthetic, WLUW Razor and Die, and all the college and alternative commercial stations playing The Safes Tasty Waves and getting us on the charts! See you Cleveland, State College, Philly, Cambridge, Newport, at end of September! Crossroads Music Festival in splendid KC, Circle-A in MKE and Scoobfest in Green Bay both were a gas, thanks to all you kind people! Wanna be part of the coolest music festival around, head tons of killer bands, meet other sweet music lovers and eat some tasty KC BBQ? Trust us, you do! Grab your tickets for the Crossroads Music Festival that we are fortunate to be playing next weekend 9/9 in beautiful KC, MO! This festival is masterfully produced by Bill Sundahl, KKFI 90.1 FM radio station and some of KC's finest like Jaqui Craig! We can't wait! Midwest and East coast we a're coming for you!!! Check Shows page for the dates! Popmatters Jedd Beaudoin premiered The SAFES - Tasty Waves. Read Jedd's review while streaming it in it's entirety here! Listen up for our second single, "Mediocre Jokers" premiered here by Jim Kopeny at Chicagoist! Thanks to Stereogum for premiering the first music video & single from The Safes Tasty Waves out Sept 8th on Hidden Volume Records, folks! Watch this "Hometown" video that was expertly directed and annimated by Patrick Oleksy here! Shout out to Alternative Press for including The Safes "Hometown" video single as 13 songs you need to hear! The Safes are thrilled that we'll soon be sharing with you our first single, "Hometown" from Tasty Waves via Patrick Oleksy magnificently animated and directed music video - LOOK OUT! The Safes have the best friends. Thanks to you! We will see you soon in your towns soon! Thanks to all the lovely people that came out to Montrose Beach on the 4th of July - what an awesome night! The Safes are thrilled to be releasing our next LP, Tasty Waves, with Baltimore's garage rock maven Hidden Volume Records on September 8, 2017! Be on the lookout the limited edition two color vinyl options! Dr. James William Glass surgically crafted the Streets and Sanitation video! So cool! with The Safes and The Means of Production. Cya there! Bickhamstock show at Double Door on Friday Feb 17 playing along with Little Boy Jr, Coyote Riot, PM Buys! Just tracked some french horn and trumpet for the next album - sounding cool! Radio, Radio - Monday Jan 9 @ 10pm CST tune into WGN Radio to hear The Safes on The Download with Justin Kaufmann! TV - TV - TV - TV --Wed Nov 23 at 8:45am (CST) tune into Fox Morning News to hear The Safes play live the morning of Friendsgiving! spin a new cover song we recorded and tracks off White Mystery and Flesh Panthers new albums! Ages 18 and over! FUN. DJ James VanOsdol and longtime supporter of The Safes spun "I Would Love To" on his 101 WKQX Demo312 show, thanks James! Don't miss this show - Friday Sept. 30 @ Township with The Differents, Baltimore's PLURALS, and The Laureates! 9pm - $8 Talk about a steal! Windy City shows in September with our friends from home, Philly & Baltimore! Can't wait! First one is Friday Sept. 9 @ Liars Club with our bros Red Lions and The People! Photo shoot late last month was truly special - family style, be on the lookout. Thanksgiving Eve Nov 25 at Livewire Lounge ( 3994 N. Milwaukee Ave ) - Don't miss it! Finished mixing one album Sept 18; started practicing for next lp with the boys Sept. 19. Thanksgiving Eve 2014 - with our friends The Differents kicking off the show and Back Alley Riot closing it shut! See You there. 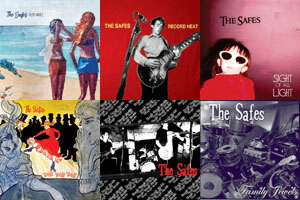 "Chicago power trio The SAFES, who pump out some of the best garage rock the music world has seen. Latest single Hopes Up, Guard Down is fun and crazy, constantly spinning and whirling in a frenzy of psychedelic garage pop." Yahoo! Music premiered The SAFES "I Would Love To" music video directed by Mickey Mangan on Oct. 20. You have to watch it!  one that shows off just how dedicated (and widespread!) their global fan base is.  in their home countries (15 represented), and in their native languages (12 represented). Talk about international appeal! If youd like to catch the Safes on tour in your town, theyre rolling through the Northeast all November. Check below for Fall tour dates. Thanks to Nic Harcourt for spinning "Hopes Up, Guard Down" on his Connections radio show! Be on the look any day now for the release of the "I Would Love To" music video directed by Mickey Mangan. So awesome! Thanks to Mickey Mangan, Giovanni Bucci, Siobhan and all our fans across the globe for being part of something we're very proud of - you rule! Check out the Shows page for our upcoming east coast tour! Can't wait to see your lovely faces again! Working on finishing up LP4 - LOOKOUT! Popmatters premiered The SAFES - Record Heat. Stream it in it's entirety here! While listening you can read stories of each song written by Frankie O'Malley! Be on the lookout for the official music video for The SAFES - "I Would Love To" directed by Mickey Mangan to be premiered soon! It's incredible. Thanks to Mickey and everyone that contributed to make a truly global video. Watch a video of The SAFES tracking and mixing Record Heat in Detroit with Jim Diamond, Jason Ward in Benton Harbor, MI @ KeyClub Recording and at StudiO'Malley. 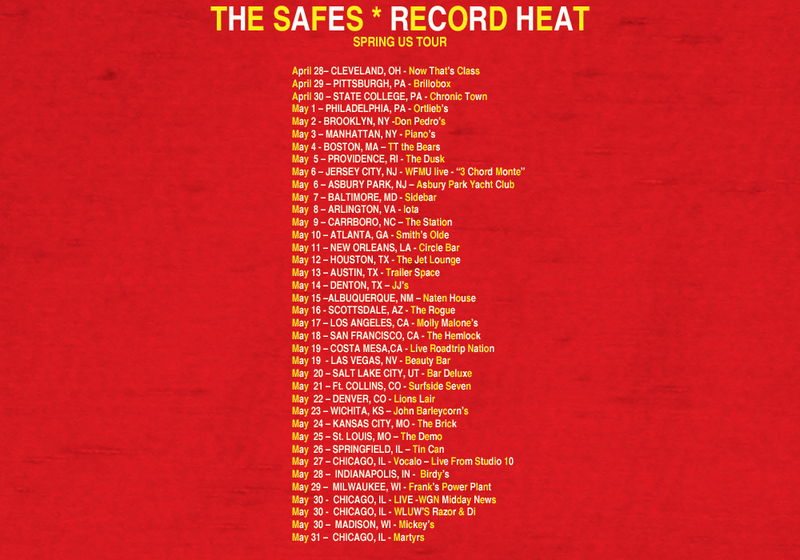 The SAFES Record Heat will be going for adds on radio on April 22 - tune into your favorite radio stations and request The SAFES! Thanks to Eric Davidson of CMJ for the video premiere of The SAFES 'Hopes Up, Guard Down"on Monday April 7 directed by our friend Mike Hindert. "Chicagos modern rock musical rep rests primarily on Touch & Gos long post-rock legacy, and deservedly so. But since the late-70s, the Windy City has also been a consistent fount of solid power pop, from the big bang of Cheap Trick to awesome also-rans like Epicycle and the Vacant Lot, regional warhorses like the Elvis Brothers. The Safes have continued along that line for a few years now. A trio of brothers (Frankie, Patrick and Michael OMalley), they credit their dad with having a home full of cool classic rock records, and they smelt loads of exhumed 60s garage and pop goodness into their bright sound. Their third full-length, Record Heatrecorded by Jim Diamond (White Stripes, The Sonics), Jason Ward (Arcade Fire) and Patrick OMalleywill be out April 29 on Wee Rock Records, and weve got a video premiere for the single, Hopes Up, Guard Down, right here. Lets just say the motorcycle bandit who zooms through this mini-movie is no chicken." Here are some stills from The SAFES upcoming music video directed by Mike Hindert of The Bravery; look for a premiere in early April! On Saturday, March 22nd we spent an afternoon at the wonderful Bucci Studios with the talented and gracious Giovanni Bucci; we surrounded by his striking sculptures, vivid paintings and other artwork during the filming some of the "I Would Love To" video with director Mickey Mangan. More info, photographs, and the epic video currently being filmed all across the globe by rad people. Just approved our test pressing for the new album which should be coming out in the spring. Can't wait for everyone to hear it! Hey STL come on out to the Heavy Anchor on Sat. Nov 23 and make sure to buy Scott too many drinks than he can drink for his birthday. We'll be playing with our friends Thee Fine Lines and the Cripplers. Not to be missed! Jet W. Lee will be tearing it up first, second on the bill will be the force of nature known as the Phenoms, then us O'Malley boys, and closing out the night will be the heavy soul sounds of The Differents. We've got some fun radio interviews coming up too! First we'll be back to talk to Hex and Jeannie on WLUW's Radio One on Thursday Nov 21 around 6/6:30pm. Then we'll be heading back into Vocalo's studio to talk to our pal Jesse Menedez on Monday November 25 at 7pm. "Live Life Like You Wanna Live" video! Check out the video of us recording "Change The Game"
Be on the lookout for some new songs on our new EP Thanks To You! "Live Life Like You Wanna Live"
Come on out to Beat Kitchen for The Differents "Christley Block" cd release show on Friday June 14th; pick up the album - its magically delicious! You can also check out this episode of Generator Rex (Cartoon Network) to hear The SAFES "Sing Along"
The Sweets will be releasing their new full-length "It's Fine. It's Fine. It's Fine." We highly recommend picking one up at the show! by picking up some of the fine creations from Katatomic Labs where everday is fun, fun, fun! A special benefit concert for Autism Speaks and Music Cares while celebrating Thomas Durkin's B-Day! stuff, including autographed music goodies from Big Star, Material Issue, another item from Game Theory... There will be a raffle. If you'd like to be part of that, please bring cash. Silent auction interested parties might want to bring their checkbooks. Tune into CRC fm Castlebar County Mayo, Ireland on December 6, 2012 CST to hear Johnny Oosten interview The SAFES. The boys would like to thank CRC and Johnny for playing our new single! to hear/see The SAFES, Decoy Prayer Meeting and The Dead On. The SAFES will be releasing our new single Century of Saturdays that evening.